Coro Nuovo | Passionate about music! 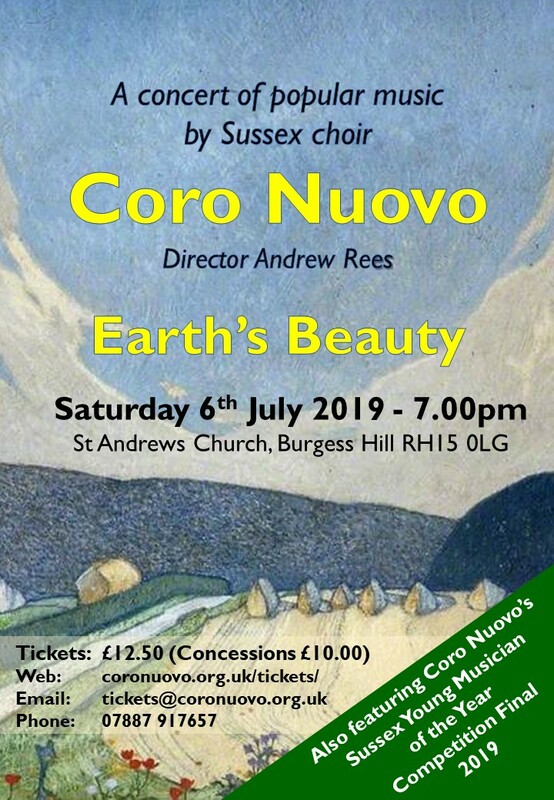 Coro Nuovo is an exciting new choir made up of the very best singers from Mid Sussex and surrounding area many of whom are professional musicians. The choir aims to explore a wide repertoire of music from Renaissance to Contemporary and is designed to be challenging, to help singers learn and develop. We aim to perform up to three concerts per year (Christmas, Spring and Summer) and we hold about 4 rehearsals for each concert. Our Music Director is Andrew Rees international tenor, who provides us with a focus on delivering quality and subtlety across a broad range of music. A feature which makes us different is “singing in the round” at the start of every concert which enables us to connect us with our audience as well as providing a touch of theatre. Previous Summer concerts have been Opera Night, Best of British, Night at the Movies, Shakespeare 400, Music and Monarchy, American Summertime. In addition we have performed Mozart Requiem, Faure Requiem and are looking forward to 2020 when we shall be singing Beethoven’s 9th Choral Symphony with Mid Sussex Sinfonia. Our outreach programme is to support young Sussex musicians choral or instrumental who are studying music and who are at the beginning of their professional career. We offer an annual bursary worth £1,000 to aid their learning and development and also offer a platform to perform with us at concerts. The finals of this competition take place at our Summer concert. In 2018 Coro Nuovo started a Coro Nuovo Youth Choir for young people aged between 9 and 15. 11 Young musicians will be competing for four places in the final of this year’s Sussex Young Musician of the Year Competition. Bursary prizes totalling £2000 are available to help young musicians aged 18-26 with a Sussex connection who wish to pursue a career in music and are studing at a recognised Music Conservatoire. The young musicians who have been selected to take part in the bursary competition auditions on the 2nd June are shown opposite. The concert includes the finals of Coro Nuovo’s Sussex Young Musician of the Year Competition. Four finalists will be competing for £2000 worth of busaries to help with their musical studies.